Our Ganchenpo Winter Expedition team arrived in Syaphrubesi – a small Tamang town which serves as a gateway for trekkers to the Langtang National Park – on the 15th of December. On the way our jeep, heavily loaded with gear, had been stopped many times at police and army check posts, the composition of our team apparently causing many questions: a Westerner lady in the front seat, four Sherpas in the back and mountains of stuff… everywhere. ‘Where is your partner?’ a young soldier at the Dunche check post enquired in a tone half-reprimanding, half-shy. ‘He chooses to stay at home,’ I answered with a smile. The army man glanced suspiciously at me, then – at my companions, and finally waved his rifle in the direction of Syaphrubesi. 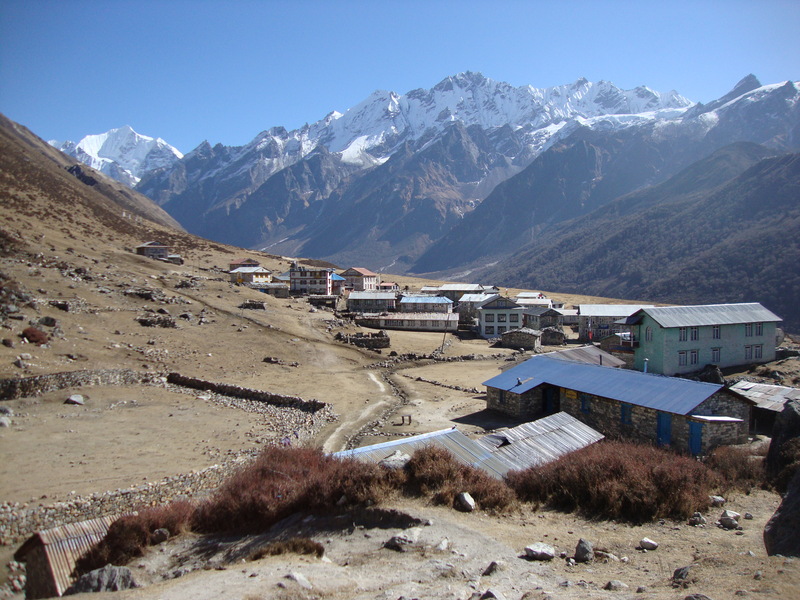 From there we would walk to Lama Hotel, Langtang and Kyanjin Gompa in three days before leaving all familiar trails behind and establishing Ganchenpo base camp at the foot of the mountain. I found trekking in Langtang to be straightforward and easy compared to the Everest and Annapurna regions. The trails will not surprise you with unexpected turns, climbs and descents but they will exhaust you with their persistence in going either up or down – uncompromisingly. The winter scenery was beautiful in its nakedness and simplicity: dry grass and frozen waterfalls, browns, dark greens, pale reds and blues of the elements all contributed to the creation of the atmosphere of an old, unforgettable dream. The language spoken in the region is Tibetan, and I happily practiced the few things I’d learnt in Kathmandu on the locals, occasionally even being understood. 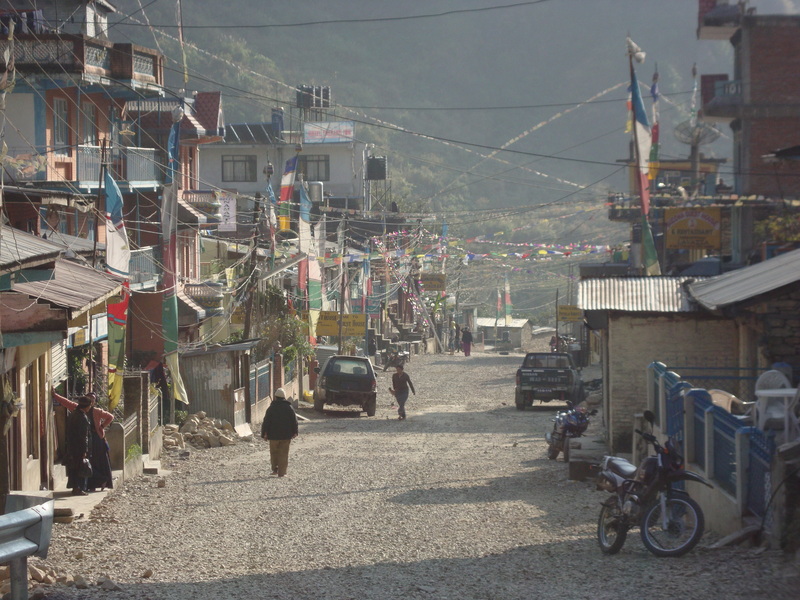 However, most of the way to Kyanjin Gompa I walked quickly and quietly. Looking at the white vertical West Face of Ganchenpo, which first showed itself to the team in the village of Langtang, I was certain I had nothing but failure to expect from the climb. Such was my certainty that I was in a hurry to fail and go home for the holidays. ‘What on Earth had made me think that this stunning peak, which not even the strongest of climbers could conquer, would let me reach its summit?’ I kept asking myself. It was the confidence and determination of my team that kept me even willing to try. We left Kyanjin Gompa on a sunny morning and trekked for some 3.5 hours crossing an icy river and climbing up trails used by yak herdsmen until reaching the altitude of about 4500 metres. 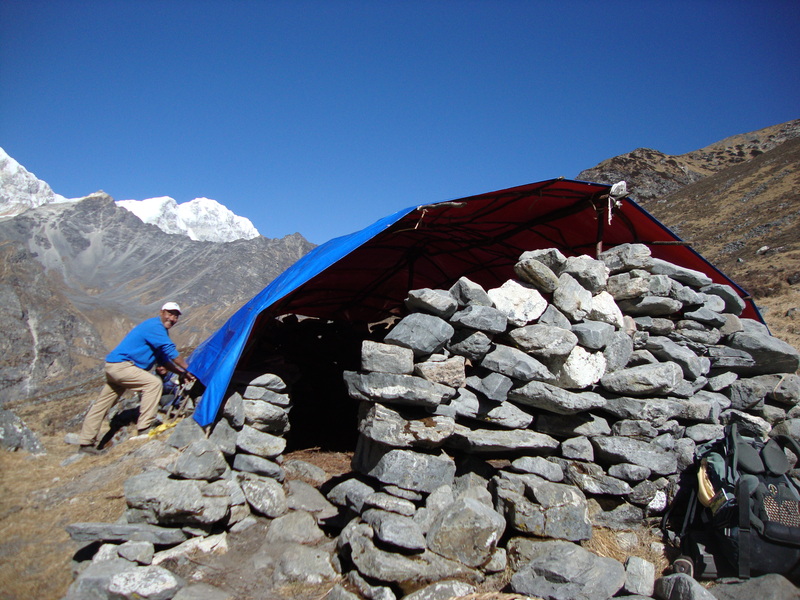 The windy place covered with dust and dry grass boasted a couple of level spots for our tents and, most importantly, a ‘kitchen’ – a basic structure of grey stone where herdsmen live and cook when the grass is green and succulent for their yaks. While the boys worked on the tents and the kitchen, I walked around the barren area, breathing in the dust and the cold feeling strangely out of place and out of time. Soon the tents were up, and dinner was cooking on two large kerosene stoves. We ate our dal bhat (rice with pea soup and curry), talked about mountains distractedly and went to sleep. We would spend the next day at base camp, too – to prepare for the climb and aid my acclimatization. Lying in my three-person tent, I felt colder and more alone than ever. I was thinking of my family, of home, and for the first of many times to come one of my poems, ‘Never Return’, began reciting itself in my mind insistently: I know I will never return home, you can now call me your own. There’s something about your writing that makes me want to hold my breath until I finish reading…just love reading your posts…have a safe and wonderful new year. And I certainly love it that you keep reading and enjoying yourself as you do so! Thank you for that! All the best in 2012 ;)!